The west coast of Italy and the islands of Sicily and Sardinia are part of the Mediterranean and are often visited on a Mediterranean cruise but they can also be explored by train, plane, or car. A rail line runs down the west coast from the French border all the way to Sicily. By car, you can drive from the border all the way to Calabria, the toe of the boot, and take the car ferry to Sicily. You could make a travel itinerary with several places on the Mediterranean coast or choose just one of these top seaside destinations for your vacation and spend a week or two there. Let's take a look at the top places to go in Italy on a Mediterranean vacation, starting from the north. The part of Italy's coast known as the Italian Riviera is in the Liguria region and extends from Ventimiglia, just across the border from the French Riviera to the Gulf of Poets just north of Tuscany. 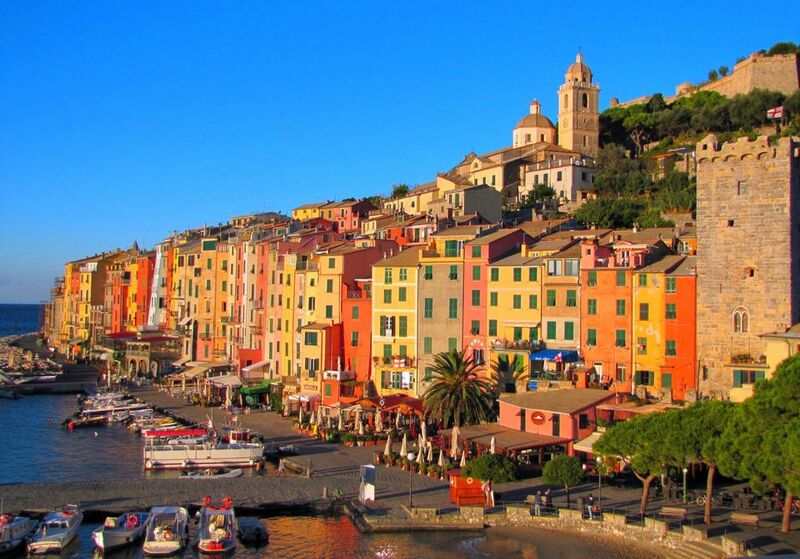 The Italian Riviera is full of charming seaside villages and resort towns including popular places like Sanremo, Portofino, and the Cinque Terre. The best way to explore this part of the coast is by the train that runs along the coast and in the summer, many towns can also be reached by ferry. There's an airport in Genoa if you want to fly into or out of the Italian Riviera. While Tuscany is mainly known for its hill towns, wineries, and the city of Florence, it does have a good stretch of coast for those looking for beaches and good places to swim. Northern Tuscany's Versilia Coast is a long stretch of good sandy beaches with clean water and a background of the Apuan Alps, famous for their marble quarries. Most of the beach is occupied by private beach establishments where you can rent a space with chairs, umbrella, and other amenities for the day or the season. Two of the best towns along this stretch of coast are Forte Dei Marmi and Viareggio, known for its Liberty-style architecture. In southern Tuscany, Monte Argentario offers a completely different seaside experience with its rocky, rugged coastline and forested interior. While there are beaches, the highlights are a nature reserve, hiking, and boat trips to the Tuscan archipelago. Heading south from Tuscany along the coast you'll arrive at the cruise ship port of Civitavecchia, then Ostia Lido and Sperlonga, two of the beaches to visit from Rome. Southern Italy's ​Amalfi Coast is probably the most famous and spectacular Italian coastline. Picturesque villages such as Positano rise up the cliffs from the sea, where you'll find beaches and nice places to swim. Taking a boat ride is the best way to see the coast as the windy road is narrow and often crowded. The Amalfi Coast is a great place for relaxing and enjoying the ambiance but there are also hikes and interesting things to do, guided excursions, and several great day trips, including visiting the enchanting island of Capri. South of the Amalfi Coast you'll come to the Cilento National Park and then the Maratea Coast on the Tyrrhenian Sea in the Basilicata region. This part of the coast isn't as developed as the Amalfi Coast and in many places, the forest stretches almost to the rugged coastline. The sea is clear and great for swimming although the beaches can be rocky. It's a serene area where you can relax and enjoy the wilderness feel. We stayed at the Santavenere Luxury Hotel, a great choice for a seaside getaway. There's a small harbor town on the coast but the charming town of Maratea is tucked away in the hills a few miles from the coast, originally hidden from the view of pirates roaming the seas. Finally reaching the toe of the boot, the Calabria region is almost completely surrounded by coastline, giving it many fine beaches and seaside towns. Sicily is the largest island in the Mediterranean and is surrounded by beautiful beaches and coastal towns. One of the top towns on the coast is Taormina, Sicily's first resort town, with excellent beaches, a medieval quarter, and a Greek theater overlooking the sea that's used for outdoor performances. There is a huge variety of things to see on the island from Greek temples and Roman ruins to Norman castles, beautiful Baroque towns such as Noto and Ragusa, and even a volcano. Palermo, the island's capital city, is known for its lively markets, Byzantine mosaics in the Norman Palace, its huge cathedral, and catacombs. Sicily has two airports, in Palermo and Catania that connect to cities on the mainland. If you're arriving by train or car you'll have to take a ferry from the mainland. The Mediterranean island of Sardinia is known for its beautiful coastline and clean beaches. The most famous part of the island is the Emerald Coast, home of the rich and famous, but other parts of the coast are much more affordable. One of the most charming towns to visit on the coast is Alghero, with its Catalan heritage. Going inland you'll find fascinating villages steeped in traditions. The island is dotted with nuraghi, ancient stone towers unique to Sardinia, interesting archeological sites, and Romanesque churches. if you arrive by ferry or plane, Cagliari, the largest city on the island, makes a good place to start your visit. Sardinia is connected to the mainland and Sicily by ferry or by plane with flights to Cagliari, Alghero, or Olbia airports.